Chesterfield Actors on Stage Ad 1929 This is a June 1929 advertisement It is a nice black and white ad from Liggett & Myers Tobacco Co makers of Chesterfield. It pictures actors on a stage in one picture and a tobacco auction warehouse in another picture. It reads, What a cigarette meant there (for the actors ) and what a cigarette meant here (for the manufacturers) Nice graphics from an early magazine. In mint condition. Photo is taken through plastic and may show wrinkles or crookedness that is not in the ad. This magazine tear sheet measures 8 1/4"" wide by 11 1/2"" tall. 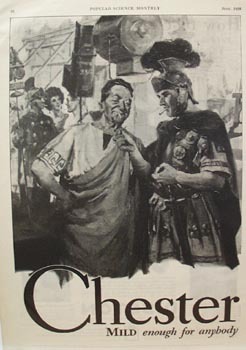 Items Similar To "Chesterfield Actors on Stage Ad 1929"
Chesterfield King Cigarettes 1960 A.